The EEA's role is to report on the state of Europe’s marine environment in relation to the relevant EU policy goals and how the state of the marine environment influences European citizens’ well-being. The assessment framework developed for the EEA marine reports and SOERs responds to this reporting ‘need’ of Europe. Thematic and integrated assessments, as well as providing specific technical and expert advice, aim to represent relevant and timely support and knowledge to address specific EU marine policy implementation requirements. The ensuing knowledge base also informs the assessment and evaluation of the more cross-cutting EU policies, e.g. the 7th EAP, the EU Biodiversity Strategy, by 2020, and, ultimately, links to the next EEA SOER in 2020. Marine ecosystems support people's basic needs and well-being. It is necessary to better manage human use of the marine environment to avoid reducing such support over time. Marine assessments allow the EEA to better gauge whether Europe's marine natural capital is being used sustainably, allowing the renewal of marine ecosystem capital and the maintenance of the marine ecosystem services flowing from it. The 2015 EEA 'State of Europe's seas' (SOES) report was the first holistic assessment of the marine environment, setting the starting point for the EEA's future work on the marine environment. The EEA's marine assessments aim to review the state and trends of the marine environment and trends in maritime activities. Assessment products aim to place such a review in the context of the need to use Europe's marine natural capital sustainably in order to ensure the continued provision of ecosystem services to, and associated benefits for, European citizens. Key to fulfilling such an objective will be assessing the state of and trends in Europe's seas using the DPSIR assessment framework (Driver, Pressure, State, Impact, Response). It will also be important to build on it to deliver holistic, marine ecosystem assessments following the MAES (Mapping and Assessing of Ecosystems and their Services) conceptual framework. The assessment work is designed to provide adequate input and feedback to the EU marine and maritime policy framework, and thus support its implementation. 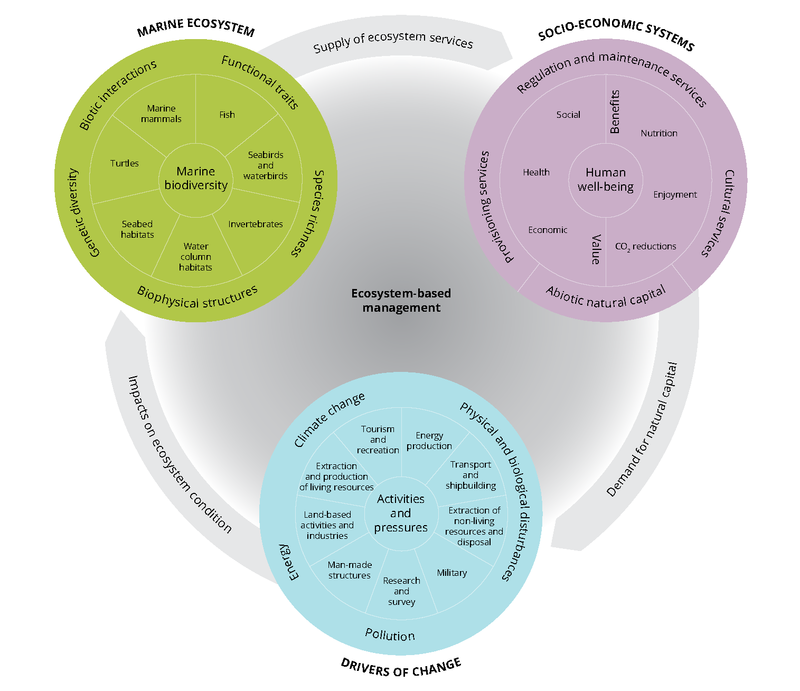 This is, in particular, the Marine Strategy Framework Directive (MSFD), and the Biodiversity Strategy, with regard to ecosystem services assessment and accounting. Fulfilling all these objectives requires applying not only established but also emerging, innovative assessment approaches and tools. The EEA's work on marine ecosystem services focuses on developing a framework and methodology to deliver an EU-level, one-to-one policy-relevant, qualitative marine ecosystem services capacity assessment. EEA marine assessments are based on the conceptual framework, which fits the complex EU policy context. Europe's seas and coasts The ecosystems of Europe's coastal areas and seas have been significantly altered by centuries of human exploitation. Recent evidence shows that human-induced change in marine ecosystems has greatly increased in the past 60 years. The seas have become busier places, driven by a combination of technological advances and society's increasing demand for food, energy and other resources. For references, please go to https://www.eea.europa.eu/themes/water/europes-seas-and-coasts/assessments/assessments or scan the QR code.